A former Cougar running back has more than 50 busts in the NFL hall of fame. 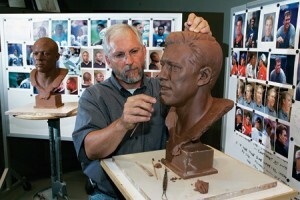 Blair Buswell has captured dozens of football greats–including Barry Sanders and John Elway (above) and his former BYU teammate Steve Young (top)–in bronze for the Pro Football Hall of Fame. During BYU’s football glory years, Blair Buswell (BA ’82), of Alpine, Utah, played running back under coach LaVell Edwards (EdD ’78). His experiences on the football team helped him go pro—but not in football. In fact, Buswell came to BYU in 1979 on a scholarship for art, not athletics. Splitting his time between the studio and the stadium, Buswell developed interests that would lead to his eventually becoming one of the top sports sculptors in America. In 1990 the United States Sports Academy named him the Sport Artist of the Year, making him the first sculptor to receive the honor. “We thought he was just like most of the guys out there playing,” recalls Tom A. Holmoe (BS ’83), Buswell’s former teammate and current BYU athletics director. “When I first started to see his artwork, though, I was like, ‘Why are you playing football? You’ve got to save those hands!’” The team doctor agreed and created protective pads for Buswell’s hands; they were checked before every game. The blending of his artistic and athletic interests paid off in 1982, when San Francisco 49ers coach Bill Walsh came to a BYU athletics awards banquet as a guest speaker. Buswell was being recognized as an outstanding student athlete, and some of his sculptures were on display. 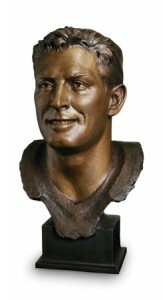 Walsh admired Buswell’s sculptures so much that he asked for a rendering of himself and then–49ers owner Eddie DeBartolo. They were impressed enough by the results to recommend Buswell to the directors at the Pro Football Hall of Fame. Since that time Buswell has completed more than 50 busts of hall inductees, including his former teammate Steve Young (BA ’84) last year. But Buswell hasn’t limited himself to sports sculpture. He’s sculpted many other subjects, including actor Charlton Heston and Utah astronaut Don Lind. His work can be found in collections across the country, including museums, college campuses, and sports complexes. And what is he sculpting today? “Cowboys and Indians,” he says. The design will consist of a block-long wagon train, a herd of running buffalo, and a flock of Canadian geese. Buswell has worked alongside fellow Utah sculptor Ed Fraughton on their part of the project, the wagon train, for the past four years. They installed the first of three phases in September 2005.